What is Karana Mudra? It is used for the removal of negative energy, negative thoughts and obstacles in one’s life. The Karana mudra is the mudra which expels demons and removes obstacles such as sickness or negative thoughts. It is made by raising the index and the little finger, and folding the other fingers. Karana is a powerful Buddhist hand gesture. The Karana hand gesture has been proven to cure anxiety and depression and to create heightened levels of happiness. It does this by removing what Buddhists call obstacles which include things like depressive thoughts and feelings of unhappiness or anxiety. So, if you are suffering from any sort of negative state, you can sense a very determined, focused energy just by looking at this hand gesture. Cause it expresses a very powerful energy with which negative energy is expelled. And that is precisely what the Karana mudra does. 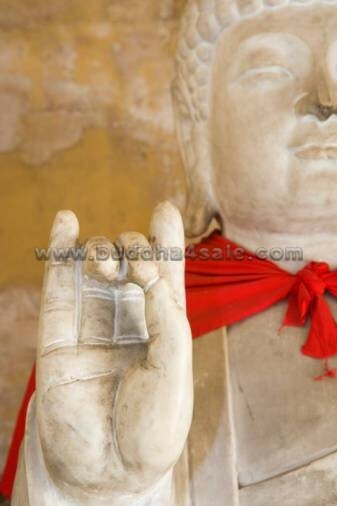 If you have a Buddha with the Karana mudra, be very mindful about its placement, be it in a home or office. You do not want it to face the front door (which should have welcoming energy). By the same token, you do not want it in your bedroom or your child’s room. So where is the best FengShui placement for a Buddha with the Karana Hand gesture? It is highly recommended to consecrate a Karana Mudra Buddha in any Bagua area that needs strong clearing, or in a problematic area of the house (such as windows facing a low energy alley, for example), etc.